Disney’s free Where’s My Water iphone app has just been updated to include 10 new levels inspired by the new movie Frankenweenie. Frankenweenie, which hits theaters on October 5, is a black and white, stop-motion animation film from Tim Burton. It’s a full-length remake of a short film he made back in 1984 in homage to the classic film Frankenstein. Mourning the loss of his dog Sparky, young Victor uses all of his scientific knowledge to bring the puppy back to life. He tries to keep his actions a secret, but Sparky escapes and causes all kinds of trouble. The film is a throwback to the classic Burton movies like Edward Scissorhands and Nightmare Before Christmas with it’s dark themes, off-kilter characters, and poignant charm. The Where’s My Water Frankenweenie make-over includes stitched up ducks, skulls spinners, and a spooky soundtrack. 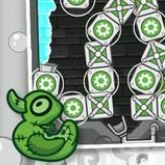 The 10 Frankenweenie levels are not available in the paid versions of the game. To try out the new levels here, we had to head over to Google Play and download the free version. Same story with the iPhone/iPad version of the game. Over on the Apple app store, the free version of the game has a promo for the Frankenweenie levels, the paid version does not. Disney has also released the Frankenweenie soundtrack on iTunes. Disney Rewards Members can get in on a few more Frankenweenie specials including 300 bonus points when they see the movie at an IMAX theater, or a free ticket with the purchase an eligible Blu-ray movie. The Disney Rewards site has all the details. Here’s the trailer for the new levels. Have you tried them? Let us know what you think of them below!